Donostia-San Sebastián. 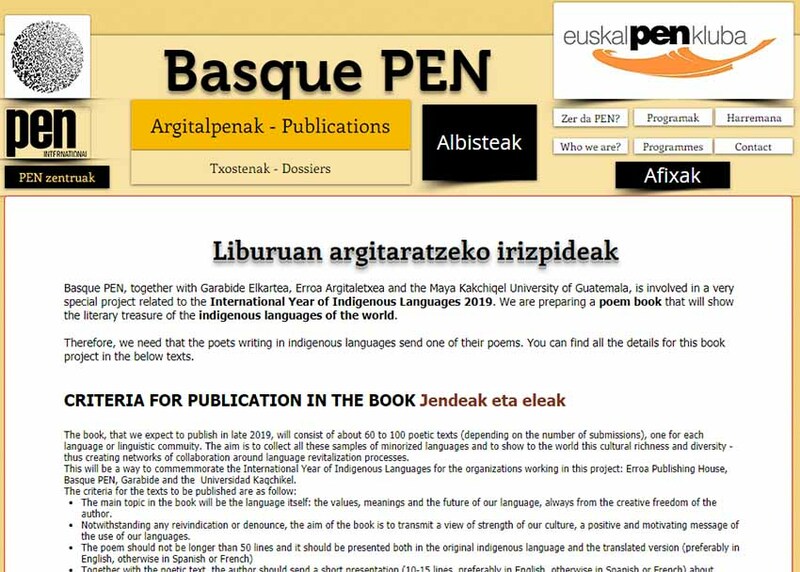 The Basque PEN Club (Euskal PEN Kluba), along with Garabide Elkartea, Erroa Publishers, and the University of Maya Kakchiqel in Guatemala, is putting together a book of poems with works in different indigenous languages of the world. The hope is to support and share the literary treasure that they entail by publishing them. All of this is part of the International Year of Indigenous Languages 2019. In order to complete the project, they are seeing poets who will send their works for publication consideration. The poem should not be longer than 50 lines and should be presented in its original indigenous versions as well as with a translated version (preferably in English, otherwise in Spanish or French). The author should also include a short presentation of his/her community (10-15 lines again preferably in English, or Spanish or French) including its geographic location, number of speakers, sociolinguistic situation, and any other pertinent information along with a signed declaration accepting the translation and publication of the book. The deadline to submit texts is May 15, although earlier submissions are appreciated. If more than one poem is received from the linguistic community, the organizers will decide which fits the publication best after consulting with experts in that community when possible. The book will be published by the end of 2019 and will include 60-100 poetic texts. Thank you for spreading the word. More details here.